In this photo you can see how dense are portions of the Piney Woods of East Texas, which can be at the same time both beautiful and overwhelmingly constricting. 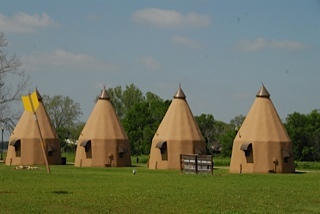 At one time, the Piney Woods covered about 54,500 square miles on the edges of Texas, Louisiana, Arkansas and Oklahoma. Although the 19th and 20th century lumber trade reduced the density of the Piney Woods, there are still places that are thickly forested as shown in the photo below. On a recent trip into the area, east of Huntsville, TX, we saw an old fashioned lumber yard that included the saw mill on the back acreage and stacks of freshly cut boards in the front near the road. From the looks of things, they still have plenty of supply growing around them. If a picture is worth a thousand words, I’m guessing this picture doesn’t need any further commentary to reveal the heart and soul of Texas. This time of year in central/north central Texas usually means Bluebonnets. 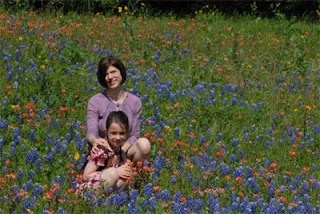 It’s common for the girls/women in a family to sit among the flowers to have their photos taken with the natural beauties. 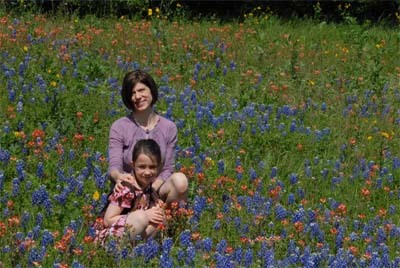 Following the Bluebonnet theme of the last two posts, here are my girls: one born in Texas, the other in Israel.